A gym in Rochester, New York uses energy generated by its workout machines for power. The whole point of working out is to expend some energy, but what if instead, you could create it? 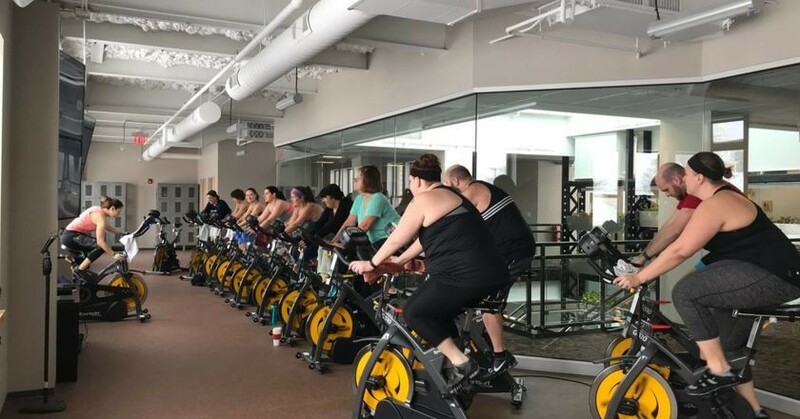 That’s the vision behind Eco Gym, a new green fitness center in Rochester, New York, that is equipped with indoor cycling equipment that captures the energy from your workout and turns it into electricity to power the building. While the gym is fully equipped, there are 21 cardio machines that generate energy—16 indoor cycles, two recumbent bikes, and two ellipticals. The equipment works by turning human energy into utility-grade electricity through a micro-inverter technology. When plugged into an outlet, the equipment converts the energy produced through the workout into kilowatts that are capable of producing more than 160 watt-hours of electricity in a single workout. Though that’s not enough to power the whole gym, the energy produced by the equipment is collected along with the electricity generated by a 26-kilowatt rooftop solar PV system and 2 8.9-kilowatt small wind turbines. Together, these green energy methods power the entire building. The gym is part of the project known as the Imaginarium, an art gallery and science center located inside I-Square, an environmentally responsible and Net-Zero Energy mixed-use development that features restaurants, a conference center, rooftop gardens, an outdoor amphitheater, and office space. This isn't the first time a gym has used members' workouts to save on carbon. In fact, SportsArt equipment can be found in gyms across the world, and the company is working to make every workout give something back to environment.